Quality Policy Statement TECNI Ltd (the ‘Organisation’) aims to provide defect free products to our customers on time and within budget. The Organisation operates a Quality Management System that has gained BS EN ISO 9001: 2015 certifications, including aspects specific to the provision of wire rope products and lifting equipment supply, service and inspection (TECNI ltd). 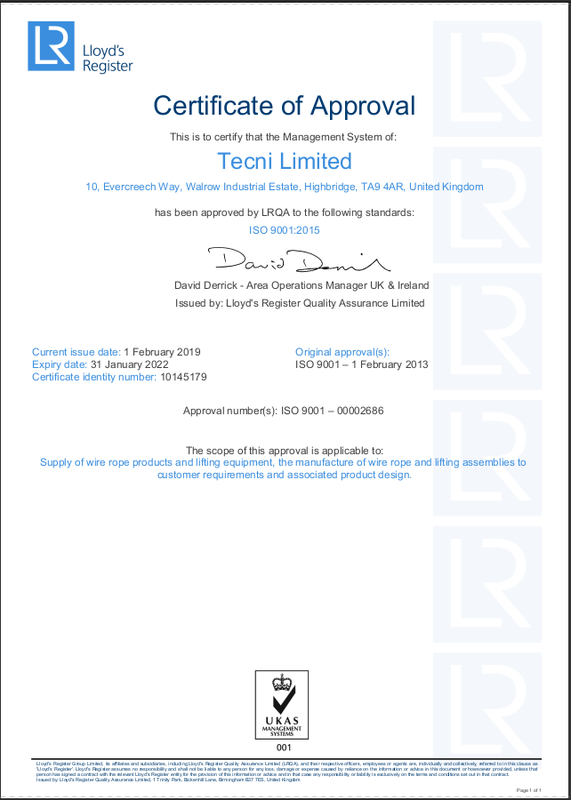 TECNI Ltd is a BS EN ISO 9001:2015 approved company Registered Company No. LRQ 4007492. We take pride in the fact that our products will last in service, and are designed for long term usage. We only use ISO:9001 registered suppliers and suppliers with alternative recognised quality systems. TECNI Ltd use an advanced lot and serial number tracking system to ensure that all goods are traceable back to source. Where items are supplied to relevant standards or regulations TECNI Ltd have the capability to produce certification. This can include but is not limited to, EC Declaration of conformity, Certificate of Incorporation, Certificate of Conformity, Safe working instructions, Test certificate, Material analysis Report (Metal). Enhancing and ensuring complete customer satisfaction.